Birds are Runde’s real inhabitants, not the 150 people. Between February and August every year over half a million birds come to nest on this island. 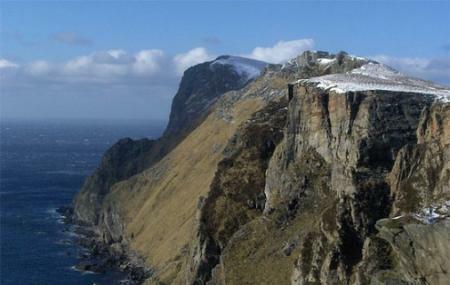 Southernmost of Norway’s nesting cliffs, Runde welcomes around 230 different species of birds. There’s two ways to take in Runde’s glory in the summer – you can either go over the land bridge, which is about a 90km drive from Alesund, or you can hire a boat to take you to view the cliffs. Try the Wildlife Sea Safari (five times a week, July-mid-August), which is a great trip though it doesn’t take you ashore. On land, you may be able to find accommodation at the Runde Lighthouse. Get in touch with the Alesund-Sunnmøre Trekking Association for further details. There are some decent trekking trails on the island, but it’s best to do your research on them before going. Fun Fact: The wreck of trade ship Akerendam (1725) was discovered in 1975, resulting in the discovery of 57000 gold and silver coins. Take the summer wildlife sea safari. How popular is Runde Island? People normally club together Runde Environmental Centre and Hiking Trip To Sukkertoppen - The Sugar Top (314 M) while planning their visit to Runde Island.